The detective is a fortyish woman in Scotland who edits an academic journal about applied ethics. Seriously? 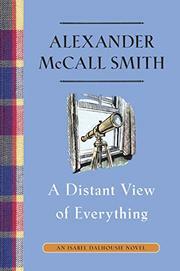 Only Alexander McCall Smith could pull this one off, and he has, for eleven books in this bestselling series of mellow mysteries. Where this series gets spicy is at the third installment, The Right Attitude to Rain (2006), in which Isabel enters into a love affair with Jamie, a handsome, kind bassoonist who’s fourteen years her junior—and also the former lover of Isabel’s niece. As with other aspects of the McCall Smith novels, you’re likely to find the Isabel/Jamie affair either charming or ridiculous. The vagaries of this relationship intertwine with the mystery plots through the rest of the novels. The mysteries don’t usually involve death. In fact, in A Distant View of Everything, the most recent of the series, Isabel investigates whether a matchmaker’s pairing of a couple is suitable. This plot line is thin, but the ongoing saga of Isabel, Jamie, and their expanding family fills in. Yes, I’ll reveal that the cougar Isabel gets pregnant in her forties, and Jamie is a doting dad. And one more thing: the Sunday Philosophy Club doesn’t actually meet. It’s more a pleasant idea. If you want to catch up with the Isabel Dalhousie books, here’s the list to date: The Sunday Philosophy Club (2004), Friends, Lovers, Chocolate (2005), The Right Attitude to Rain (2006), The Careful Use of Compliments (2007), The Comforts of a Muddy Saturday (2008), The Lost Art of Gratitude (2009), The Charming Quirks of Others (2010), The Forgotten Affairs of Youth (2011), The Uncommon Appeal of Clouds (2012), The Novel Habits of Happiness (2015), A Distant View of Everything (2017). In addition, three shorter Isabel Dalhousie stories are available as e-books.